Hillary Rodham Clinton said Tuesday that she intends to revitalize the mission of diplomacy in American foreign policy, calling for a "smart power" strategy in the Middle East and implicitly criticizing the Bush administration for having downgraded the role of arms control. At a daylong confirmation hearing before the Senate Foreign Relations Committee, President-elect Barack Obama's choice for secretary of state sailed smoothly through an array of non-contentious questions until two Republican committee members pressed her to take additional steps to ensure that former President Bill Clinton's global fundraising work does not pose even an appearance of conflict with her role as the chief U.S. diplomat. She balked, saying disclosure rules already in place were carefully crafted and adequate to avoid any conflict. Clinton appeared headed for easy confirmation. She encountered no challenges to her basic vision for foreign policy. Clinton, who will relinquish her seat in the Senate when confirmed, spoke confidently of Mr. Obama's intentions to renew American leadership in the world and to strengthen U.S. diplomacy. "America cannot solve the most pressing problems on our own, and the world cannot solve them without America," she said, her daughter Chelsea seated behind her in the audience. "The best way to advance America's interest in reducing global threats and seizing global opportunities is to design and implement global solutions. This isn't a philosophical point. This is our reality." In laying out a general outlook for American foreign policy under Mr. Obama, Clinton spoke in a clear, unhurried voice and looked at ease. She made it plain, citing policy themes that were familiar from Mr. Obama's presidential campaign - and in many cases her own - that the incoming Democratic administration wants to elevate the role of diplomacy. She and Mr. Obama contend that the Bush administration relied too heavily on the military to carry out foreign policy and that it leaned too much on ideology and too little on pragmatism. CBS News correspondent Chip Reid reports that Clinton said the current strategy isn't working, especially in hotspots like Iran. "We're going to be trying new approaches because what we've tried has not worked, they are closer to nuclear weapons capacity today than they were," Clinton said. The Foreign Relations Committee planned to vote on Clinton's nomination on Thursday. If it approves her, she could gain full Senate confirmation as early as Inauguration Day. The Senate also held confirmation hearings for other Obama choices for Cabinet and top White House positions. Appearing were Peter Orszag, to head the Office of Management and Budget, and Robert Nabors II, for deputy director of OMB; New York housing official Shaun Donovan, to be secretary of housing and urban development; Steven Chu, to head the Energy Department; and Arne Duncan, as education secretary. Chu promised that if confirmed as energy secretary he will aggressively pursue policies aimed at addressing climate change and achieving greater energy independence by developing clean energy sources. At his hearing, Duncan said that the No Child Left Behind law should stop punishing schools where only a handful of kids are struggling. Mr. Obama's choice to run the Treasury Department and to lead the economic rescue effort disclosed to senators Tuesday that he failed to pay $34,000 in taxes from 2001 to 2004, a last-minute complication in an otherwise smooth path to confirmation. Timothy Geithner paid most of the past-due taxes days before Mr. Obama announced his nomination in November, an Obama transition official said. The unpaid taxes were discovered by Mr. Obama's transition team while investigating Geithner's background, the official said. The Foreign Relations committee's top Republican, Sen. Richard Lugar, praised Clinton, calling her "the epitome of a big leaguer" whose presence could open new opportunities for American diplomacy. But Lugar also raised questions about the issue of Bill Clinton's fundraising work and its relation to her wife's new post. Lugar said that the only way for Clinton to avoid a potential conflict of interest due to her husband's charity is to forswear any new foreign contributions. The Indiana senator said the situation poses a "unique complication" that requires "great care and transparency." Before the hearing, Lugar made four suggestions to Hillary Clinton's staff on how to improve transparency in her husband's charitable fundraising, said the senator's spokesman, Andy Fisher. But in her testimony, Hillary Clinton made clear that the Obama administration would accept only one of the proposals - that the foundation provide a clear picture of its annual donations, Fisher said. 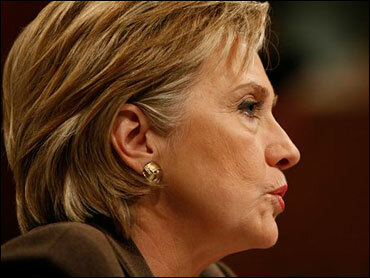 Click here to read Hillary Rodham Clinton's complete opening statement. Lugar also wanted the foundation to immediately disclose donations of $50,000 or more; alert ethics officials when such sizable donations are pledged; and apply the same stringent requirements to foreign businesses. The current plan only subjects foreign governments to scrutiny by State Department ethics officials and would not require a review of contributions by foreign businesses - a loophole that could easily be exploited, Lugar warned. She also was pressed by Sen. David Vitter, R-La., who said the Clinton fundraising posed "real and perceived conflict issues" for his wife. Few others on the committee pursued the conflict-of-interest issue and it did not appear to be a likely impediment to her confirmation. Clinton sat alone at a small, black-draped desk, with a retinue of advisers behind her. Her husband was not present. Obama spokesman Tommy Vietor said the former president was watching the hearing elsewhere with his wife's mother. "President Clinton wanted to make sure the attention was focused on Sen. Clinton," Vietor said. It was clear this was no ordinary hearing, reports CBS News State Department reporter Charles Wolfson. Seats were reserved for diplomats from a number of interested countries including Egypt and Iraq. The French Ambassador, Pierre Vimont, arrived early and chatted with journalists and committee staff members. In discussing the problem of peacemaking in the Middle East, Clinton referred to her husband's extensive, though ultimately unsuccessful, efforts to strike a comprehensive peace deal. "As intractable as the Middle East's problems may seem and many presidents, including my husband, have spent years trying to help work out a resolution, we cannot give up on peace," she said. "We must also actively pursue a strategy of smart power in the Middle East that addresses the security needs of Israel and the legitimate political and economic aspirations of the Palestinians," she said. Clinton also said that during the Bush administration, "Our foreign policy has gotten way out of balance," with the Pentagon taking too large a role at the expense of the State Department. She said she intends to rectify that, with the support of Defense Secretary Robert Gates, whom she praised as a clear-thinking leader. Lugar, who has played a leading Senate role in arms control issues, applauded Mr. Obama's stated intention to engage Russia in more arms control talks and pursue efforts to improve international controls of nuclear materials that could fall into the hands of terrorists. He said that during the Bush administration the State Department had been a "reluctant or almost nonexistent partner" in that effort. Clinton said she intended to bring more arms control experts back into the State Department, where arms control functions had been "significantly degraded" under Bush. On Iraq, Clinton said ending the war is a priority. The first step will be moving troops out of cities by June, in line with an agreement already established between the Bush administration and the Iraqi government. The agreement calls for all U.S. troops to be gone by the end of 2011. Mr. Obama has said he believes the withdrawal can be accomplished more quickly.